How to cook cauliflower is my favourite recipe in under 15 minutes. How to cook cauliflower is one of my favourite recipes that can be prepared in under fifteen minutes. I've never been crazy about cauliflower because, if food doesn't taste good then, mostly, it's a waste of time. 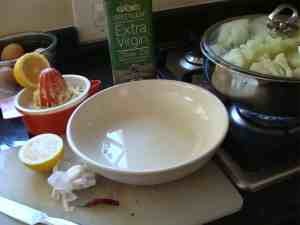 Now this is a very simple quick, delic, healthy recipe... I was taught it by my Lebanese nanny, but for enjoying green beans. In fact you can use it for any vegetable. Last week when the garden started to turn out a dozen fresh caulis (she who must be obeyed is crazy about growing cauliflower), and I started to tire of her cauliflower soup recipe, and cauliflower cheese recipe, and mashed cauliflower recipe... I started to think of Granny Jo. She died at 93 with all her marbles intact, by the way, which says mountains for the Mediterranean diet she dished up. So, I adapted her exquisite cooking green beans recipe and now we have how to cook cauliflower too. "Explaining something sensible to [former International Olympic Committee president] Lord Killanin is akin to explaining something to a cauliflower. The advantage of the cauliflower is that if all else fails, you can always cover it with melted cheese and eat it." If you have the vegetables in the garden, then wait. Go and prepare the sauce and, fifteen minutes before lunch, with everything else ready, nip down to the cauliflower patch, chase Peter Rabbit away, cover him with a basket if possible, and with a sharp knife slice through the stalk. I'm being silly, of course, but last week, the boss picked two cauliflowers. That day I tested out this salad to make sure I hadn't omitted anything; even my granddaughters, aged four and six, asked for more; we finished the lot. So the next day, I cooked the second cauliflower; it was like chalk and cheese. Freshness is everything with vegetables; after picking the sugars turn to starch. Peel off the older, mature and tatty leaves, but not the stalk, and drop them straight on the compost pile. Pour about a cup of boiling water into a pot, add a teaspoon of salt, put on the lid, and bring it to a hard boil. Using a sharp knife, thinly slice the stalk. Don't dump it. 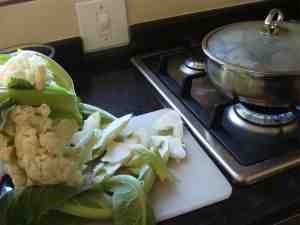 The fresh stalk is a perfectly good part of how to cook cauliflower. Once the salted water is boiling hard, throw in the young leaves, thinly sliced too, and when boiling again, toss in the stalks. Once again bring back to the boil. How to cook cauliflower is so easy. The young leaves of how to cook cauliflower too are full of nutrients, especially phytosterols, but they take a little longer to cook. What are phytosterols? The stuff that means you can eat butter instead of margarine, and feel no guilt. In any case, butter is back. Use the Site Search function in the navigation bar on your left to find the links to those topics such as what are phytosterols above, and hydrogenated foods below highlighted in bold. 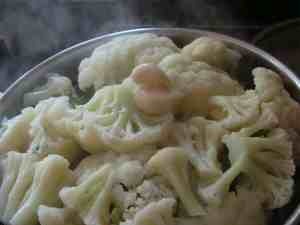 Once the thinly sliced stalks are boiling, toss in the florets of cauliflower. See, how to cook cauliflower is not the slightest bit difficult. 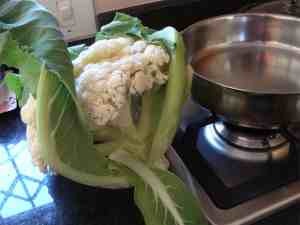 Once it's boiling hard it takes only about five more minutes before your how to cook cauliflower is complete. Easy soup recipes are high on my agenda; how to cook cauliflower is but the first step. At this stage you still have time to change to a cauliflower soup recipe, if you decide you want a hot dish instead, or even a roasted chicken on cauliflower; it definitely needs a bit of buttering up, so I'm using two or three cloves of garlic, a slither of hot red chili and the juice of a whole lemon. Aside: You'd be astonished at the difference between OJ and real freshly squeezed orange juice. OJ is little better than a junk food, with a very high glycemic index. Orange juice facts will astonished you. I'm certain it's the same for lemon juice. 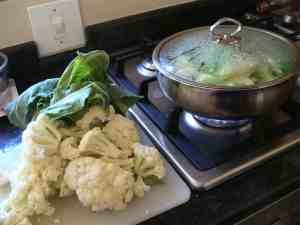 How to cook cauliflower leads you down so many alleys; interesting ways to use these nutrient dense vegetables. Normally I recommend using the pulp of the lemon too, as it contains so many of the nutrients, vitamins, minerals and fibre; but today just the juice. Have you got a lemon tree in the garden? 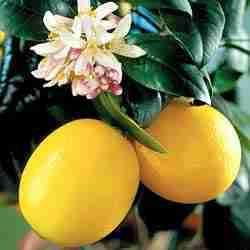 An old saying is that the first thing you do when moving into a new home is to plant a favourite from your citrus fruit list. They are so decorative, so vital, if you want delicious food; or a lime. It's a bit of a luxury but I use our electric juice press rather than this little hand squeezer should I want one lime or lemon only. As I said above, it's rare that the strainer is used; pulp and all is the general rule for literally double the nutrients. 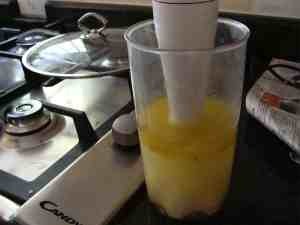 Never buy the processed juice; it's loaded with chemicals and tastes awful. Purchasing a couple lemons every week is the alternative to growing your own. The fresh vitamin C alone makes them worth the cost; one of the four vitals identified in the prevention of frailty syndrome; a determination to enjoy healthy choice foods like this is the secret to preventing the early loss of vitality and strength. You can either do it in a bowl, and whisk with a fork, or to get the bits of chili finely chopped, use a blender. 2-3 cloves of garlic. More if you like. A good slither of chili, pips and all. The capaicin, the anti inflammatory substance in chillies incidentally is most richly found in the placenta and seeds; don't dump them, but it will be hot if you add too much. If raw garlic repeats on you, gives you heartburn, or the family complains, very briefly drop the cloves on top of your cauliflower florets for the last minute of cooking. Do you see them balancing on top? Perhaps one raw and another cooked might be a good compromise. Of course you could now just drop it in an oven dish and pour a delicious cheese sauce over your cauliflower and bake it for half an hour. 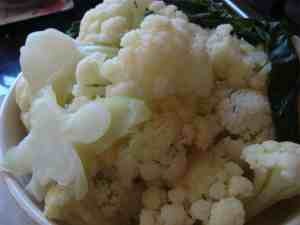 Pour your lemon-chili-garlic-olive oil juice over the florets, spooning it a few extra times over the cauliflower. Note the sliced stalk. 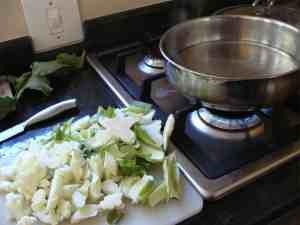 It's also perfect at this stage for your easy soup recipe. Try a bit of curry to butter it up. And definitely don't margarine it up! Hydrogenated foods are to be avoided at all costs if you want a healthy nervous system, important not just for the chiropractor; you too. So, there's nothing to our how to cook cauliflower page, right? cauli florets in garlic, chili and lemon juice sauce. homemade bread, butter and plum jam. 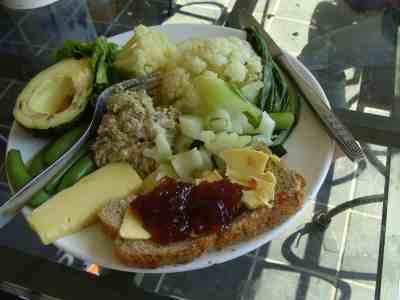 I promise: eat a lunch like this and you needn't worry the slightest about the calories in cauliflower and avocado, the cholesterol in butter and the overall carbs on your plate. You will lose weight on a lunch like this. A lunch like this has a seriously low glycemic index. Free weight loss programs use this concept. Incidentally, cooling your veggies as we have just done with our cauliflower, even eating it the next day, allows any starch to 'retrogenerate'; it becomes resistant to digestion in the small intestine and reaches the colon where it feeds the very important microbiota producing short chain fatty acids instead of glucose; no blood sugar surge. If this interests you, read more about resistant starch. This is particularly important for anyone trying to lose weight, or is insulin resistant. The lemon tree is such a beautiful, decorative tree, gracing any garden, and so full of nutrients, it rivals the avocado in my mind in our garden, though I love and respect both. Growing lemon trees is so easy. When making any salad, lemon juice and olive oil enhance both the flavour and absorption of vital nutrients. How to cook cauliflower and growing lemon trees go hand in glove. Another good reason for women of childbearing age is that all citrus contain large amounts of folate, the vitamin that prevents spina bifida. Spina bifida and orange juice, and lemons too, is a vitally important subject; this very serious, wholly preventable disease is the subject of healthy choice foods, one of our most popular pages. By the time you realise you are pregnant it's already too late if don't have sufficient folate in your diet; the neural tube in the growing foetus is formed in the first weeks. Both you and your child are condemned to a life of misery. When did you last have a lemon or orange? Hummus is a vital food if you have raised cholesterol. Want to get off those nasty statins with side effects like aching legs and impotence? Then this authentic hummus recipe is for you. I can make it in four minutes! Dinkum. If you find how to cook cauliflower tedious, this condiment will dicky it up. Whilst traditionally it's made with parsley (that stuff you must keep away from your randy teenager! ), I often make it in the winter with those sugarsnap peas you see on my plate. You can eat them pod and all; that makes them perfect for my winter hummus; but they must be fresh and sweet, how to grow peas. Now, if you managed to cover Peter Rabbit with a bushel, harden your heart, and...! Actually it's the destructive vervet monkeys that get the paintball gun treatment in our garden. See how they run...! Mixing different foods, like adding a dollop of hummus on the side after how to cook cauliflower is what makes the kitchen such an interesting room. 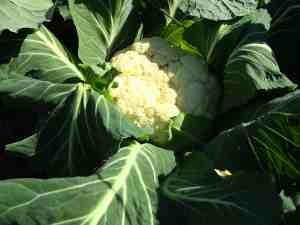 Let's face it, with out enhancement, the cauli can be rather dull. Growing these healthy, scrumptious vegetables like cauliflower is dependent on making a compost pile; it's the place where all your kitchen waste goes to unless you have a worm farm. The definition of cutworm is something you need to be up on too. The wonder of worm farms is not something that will capture your imagination until you become a greenie; then subjects like the race to end waste, and wean off plastic start to become more central than spending hours watching telly. More about cauliflower from World's healthiest foods.